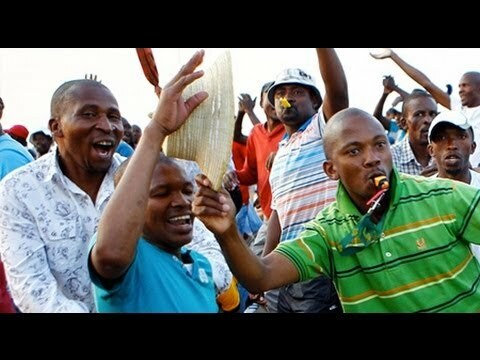 In South Africa, the Marikana platinum miners who were on strike, and many of whom were killed by police in a repression of that strike, have won a wage increase. Now joining us to talk about the significance of this and what’s happening in other mines around South Africa is Vishwas Satgar. Vishwas is a senior lecturer at the Wits University in Johannesburg. Thanks for joining us again, Vishwas. VISHWAS SATGAR, SENIOR LECTURER, UNIV. OF THE WITWATERSRAND: Thanks for having me. JAY: So tell us what’s happened since we talked last. It’s a bit of a victory for the miners, then. SATGAR: Yes, it is a victory, but it’s got to be contextualized. There’s been various things that have happened and have come to the fore. Firstly, Lonmin put an offer on the table that was not accepted by the workers. It was a pittance. That followed very closely on a state crackdown on the community. JAY: Just quickly, just to remind people, Lonmin is the owners of the mine. SATGAR: Yeah. Lonmin, the owners of the mine, put a very unpalatable offer on the table. This was rejected by the workers, which brought that collective bargaining interface to an impasse. This was followed very closely a week ago by a state crackdown on the community. The state did not declare this a state of emergency, but in practice, de facto it was a state of emergency. There’s a heavy police presence and military presence. People [incompr.] arrest in hostels. A group of women were shot at. One of those has died over the past few days in hospital. The police and the military have chased out of Marikana anybody they perceive to be inciting the workers. It’s essentially become a no-go area. And according to news reports, the military and police will be in and around the platinum belt from now till the end of January. So that’s the context in which the mineworkers continued an engagement with Lonmin mine, through the churches mediating this in the course of last week. Coming out of that engagement was this breakthrough, and this breakthrough basically put forward an offer of a 22Â percent increase for the Lonmin drill operators, in the main. It also provides for a creeping increase for other grades of workers, almost at the same level. It has been hailed as a historical agreement in the mining industry and more broadly in the South African economy. At the same time, the commentary that has come out from different quarters tells a very interesting story. The first is the union movement generally in South Africa, and particularly COSATU, was taken aback by this, raising concerns, particularly the National Union of Mineworkers, the concerns that this agreement could really have serious implications for the future of collective bargaining in the mining industry. On the other hand, COSATU, which is the federation, has embraced a living wage campaign and has also called for a commission of inquiry into the total mining industryâ€”the conditions under which workers work, conditions under which this industry operates, etc. Some sections of business have really put out a very negative assessment of this, also suggesting this is going to have very serious implications for South Africa, that it’s going to inspire an outbreak of strikes, an outbreak of militant demands across the economy. Currently, as we speak, in the platinum belts, workers have come out at all the large platinum mines, Anglo Platinum being one of them, and this demand is resonating there. The gold segment of the mining industry has also seen a large-scale strikeâ€”again, this demand is resonating there, includingâ€”chrome and one or two other mines in the mining industry are beginning to see sort of workers stepping outside of the collective bargaining system and making these demands. JAY: So what is the National Mining Unionâ€”what’s their issue with this? I know they were trying to talk the workers back to work. But how could they publicly critique a settlement like this? SATGAR: It is a very stark and explicit indictment on their role as a union. I mean, the fact of the matter is the Lonmin workers achieved this agreement and this breakthrough without any serious support from [incompr.] Essentially, the workers turned their back on the National Union of Mineworkers and the collective bargaining system. They went it alone and clinched this outcome. So I think this is really a cause for concern for them about the their own legitimacy around their own place and role in the mining industry. JAY: And in terms of the settlement, is anything known about the role of the ANC government? And it’s hard to imagine that the mine would have just done this on their own. SATGAR: Well, it would seem that even their board membersâ€”this is according to media reportsâ€”Cyril Ramaphosa, who also sits on the national executive committee of ANC, he seems to have publicly suggested that he’s unhappy with this agreement. So it seems as though it was very much a corporate sort of management-led initiative that kind of enabled this breakthrough. JAY: So this is a real message to workers throughout the whole mining sector: if you fight militantly, you can win. SATGAR: No, absolutely, and it’s an inspiring message, given the deep inequalities and disparities we have in South Africa. I mean, in the middle of this entire strike and so on, the ForbesÂ 500 millionaires listâ€”or billionaires list, rather, was issued, and Patrice Motsepe, including Cyril Ramaphosaâ€”these are prominent black African capitalists, both of them operating and having interests in miningâ€”Patrice Motsepe has come out on top with over R20Â billion in asset value and wealth value, and, you know, he’s made his money in the platinum industry. So, you know, workers and the public have been asking questions: you know, is the demand really unreasonable given that we’ve seen a concentration of wealth at the top in South Africa’s fledgling democracy? JAY: So the reverberations of this are far from over, and particularly from even within the ANC. SATGAR: I mean, the Marikana moment has really marked the South African consciousness in various ways. I mean, the first, of course, is the massacre and the whole challenge around our democracy, a whole challenge around protecting worker rights, and particularly the right to strike, and improving working conditions and breaking with the apartheid model and pattern of employment. And COSATU, interestingly, coming out of its Congress, a national congress which happened this week, COSATU being the National Congress of South African Trade Unions, has adopted a dedicated resolution in which it is committed to really tackling the apartheid working and wage conditions. The second important implication coming out of all of this is the whole challenge for justice. Now, as we stand, the state president’s appointed judicial commission of inquiry has just issued its terms of reference. The terms of reference seems to be very narrow, just wanting to focus on the massacre of AugustÂ 16. This has been challenged by AMCU, as well as the strike committee, who want the terms of reference to include the week preceding AugustÂ 16, when there was also at least ten deaths, or ten murders, if you like, and they want all of that investigated. The process around the commission is also going to be very, very critically observed and monitored by civil society. The campaign for support of Marikana is very active in building up resources and so on. They are talking about a watchdog body made up of high-profile South Africans, maybe Archbishop Desmond Tutu and others, who would comment and monitor the judicial commission of inquiry’s work over the next couple of months. JAY: Alright. Thanks very much for joining us, Vishwas. JAY: And thank you for joining us on The Real News Network. And if you want to see more stories like this, don’t forget "Donate" button. If you click on it, we can’t do this.